The fight against corruption in China today claimed its most renowned piece with the life sentence of Sun Zhengcai, considered until a year ago as a possible successor to President Xi Jinping. 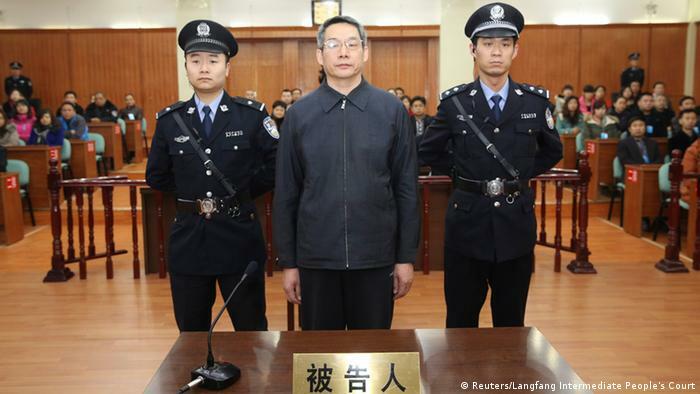 Sun, 54, was sentenced by the Tianjin Intermediate People’s Court (northeast) for taking bribes valued at around 170 million yuan (27 million dollars, 22 million euros). Until his fall from grace, in July of last year, Sun was the first Communist Party (CCP) secretary in the Chongqing region and had previously been Minister of Agriculture. Due to his status as a regional leader of the Party in a key area since he was one of the youngest members of the Politburo of communist formation, Sun was unanimously considered by observers as one of the great favorites to access positions of relevance at the state level in the XIX Congress of the (CCP) last October. The sentence handed down today also means that Sun will be deprived of his political rights for life, all his personal property has been confiscated and his illegal profits – and the profitability obtained with them – will be recovered by the State. However, several foreign observers consider that the fall from grace of Sun has also had a political root, being a member of a rival clan of Xi Jinping. “Corruption, in this case, is an excuse, the real reason is political, Sun was a protégé of (former prime minister) Wen Jiabao,” so “he is not a man of Xi and it was dangerous” for the president to be a member of a younger generation of leaders, Jean-Pierre Cabestan, director of the Department of Political Science at the Baptist University of Hong Kong, told Efe. Cabestan considered that the speculations that placed Sun as a future aspiring president were a little exaggerated, and placed him rather as a candidate for prime minister. The sentence against Sun could have been more serious (there is the death penalty for these crimes) but the defendant “admitted his guilt, showed repentance and stated that he would sincerely accept the judgment of the courts,” according to the authorities at the beginning of the trial. started on April 12. With the fall of Sun, Xi will be able to select one of his young trusted men, such as Chen Miner, elected at the last CCP congress as a possible president’s dolphin, said this veteran expert on Chinese politics. The trial of Sun is part of the anti-corruption campaign initiated by Xi since his arrival in the presidency in 2013, which has resulted in punishment of more than one and a half million senior Communist Party officials, including some of the most powerful politicians and military of the past decade. So far, the most notorious corrupt “tiger” to fall in this campaign had been the powerful former Public Security Minister Zhou Yongkang, sentenced to life in prison in 2015. Sun’s case is not the first to occur in Chongqing, an area of great economic importance, where Bo Xilai, former Minister of Commerce of China and who succeeded Sun himself as general secretary of the party in the province, was also sentenced to life in prison for corruption. Bo’s wife, meanwhile, was sent to prison for life accused of murdering a British businessman. The sentence to Sun was disclosed in Chinese state media, but several of them deactivated in their Internet pages the system to see the comments that were written about the case by the readers.